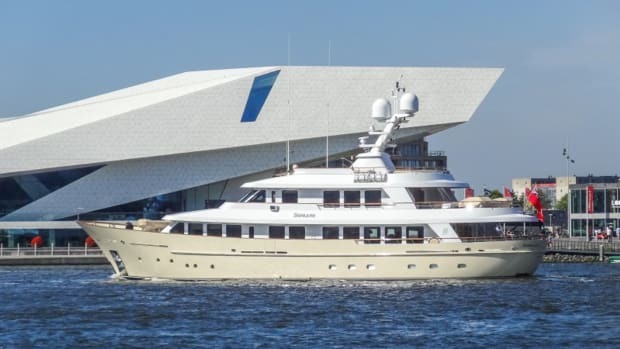 This Truly Classic 90 from the boards of Hoek Design has been finished to the highest standard, resulting in an elegant and luxurious yacht which is equally at home cruising as she is on her occasional appearances competing in superyacht regattas. 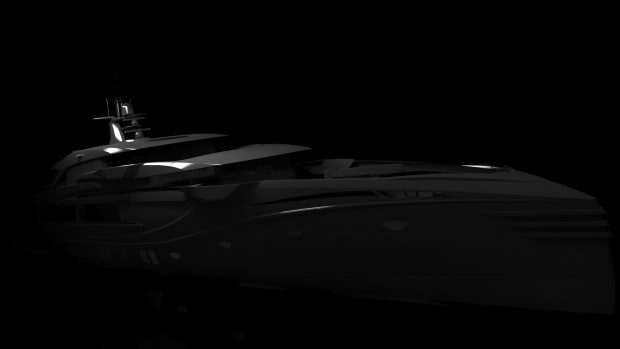 Acadia is the 26th yacht designed by Hoek Design to be built at Claasen. Acadia offers a perfect blend of classic lines with the very latest technologies. 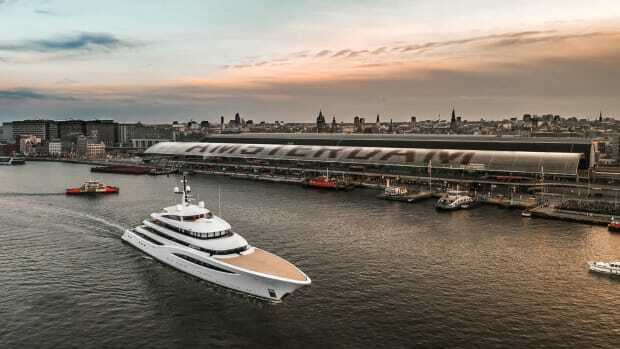 She boasts an eye-catching white hull, with a deep red underwater ship and a vivid red waterline adding to the distinguished and traditional look. The exterior is finished with finely varnished teak details to further enhance a boat that will clearly stand the test of time in every respect. To ensure this is the case in terms of maintenance, bespoke covers have been made to protect the varnish on the wheelhouse and other areas during passage making. Seen from the shore, Acadia’s giant mast and sails make for a striking sight. Stand on the deck and you will sense how that visual excitement is mirrored by a phenomenal performance once the yacht is underway. 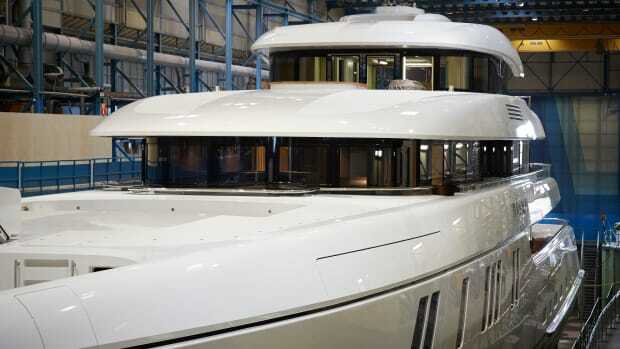 The 35.60-metre keel-stepped mast and 11.40-metre boom were made in carbon fibre by Hall Spars in the Netherlands. 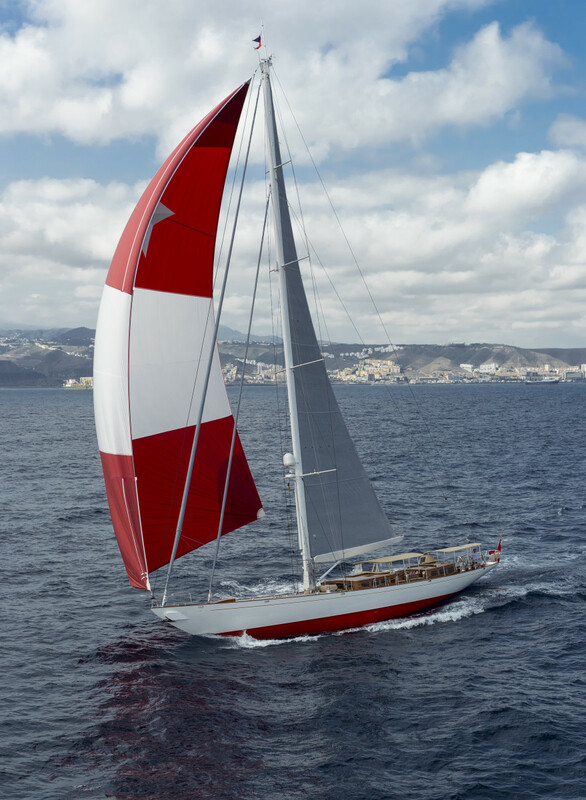 The carbon fibre sail package supplied by Doyle and includes a mainsail, yankee and staysail, all of which can be operated from the aft cockpit, plus a brilliant red & white top-down furling Asymmetrical A3 and a stunning 580 m² A2. 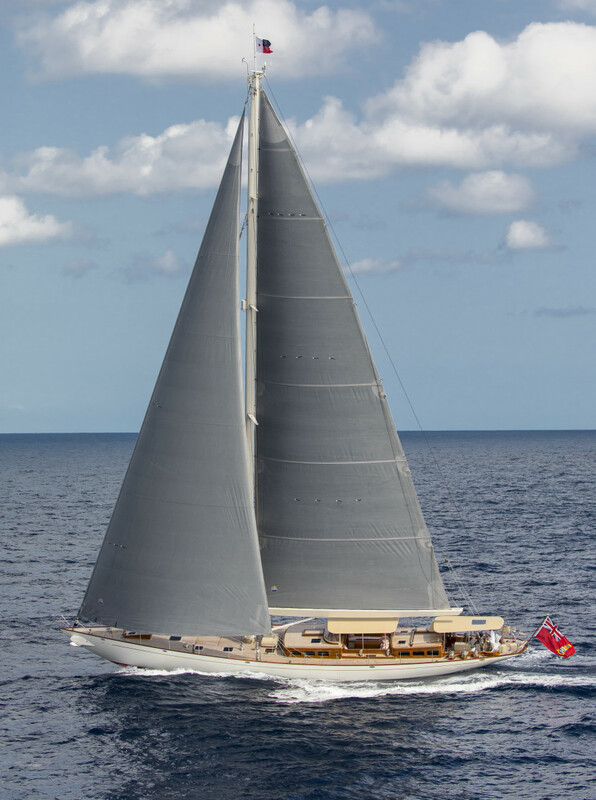 The rig is lighter than that of the previous two Truly Classic 90s: in combination with a lower cross-sectional area (reducing drag), carbon standing rigging from the Swiss firm CarboLink (making for a stiffer boat with more righting moment) and in-depth calculation work carried out by Hoek Design, this has significantly enhanced Acadia’s sailing capacity. The visual impact of the rig is further complemented by having all the anodising on the mast in a silver colour, matching the winches and deck hardware.. Even the furlers have been silver anodised and the carbon furler foils on the headstays painted in metallic silver. 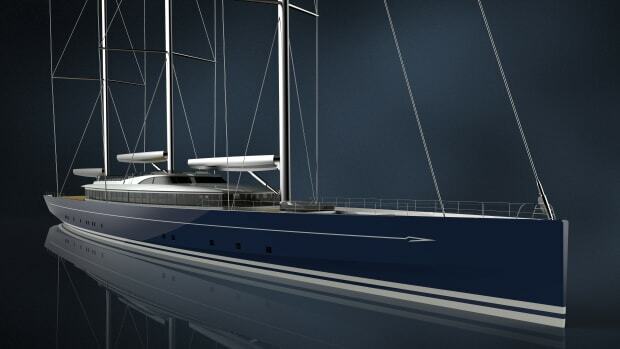 The effect of these silver accents against the titanium grey sails is stunning. From stern to sail, the hardware package looks fabulous, generating a slightly modern take on the spirit of tradition look. 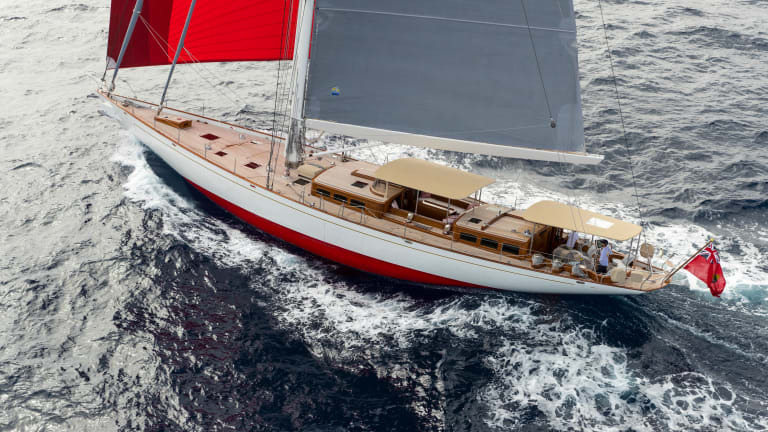 The teak deck is also superbly laid out above a whole world of technology accessible via Rondal hatches. Add in the Lewmar winches and it is clear that Acadia wants for nothing but the best in the quality department. In addition to choosing equipment and hardware that scores as highly in performance efficiency as it does in aesthetics, the owner had added distinctive visual touches of his own on deck. These include a charming shell image laser-cut and caulked on the pulpit seat, with two more on the aft fishing seats. There is also a custom stainless steel name plate on the starboard cap rail, the first such on a Claasen boat. The twin cockpit arrangement that is one of the hallmarks of the Hoek Design concept comes into its own on Acadia. The centre cockpit is a fine place for socialising: the option to fully enclose the space with a bimini ensures a nice area to sit when exploring Northern Europe or Scandinavia while the rain is coming down. 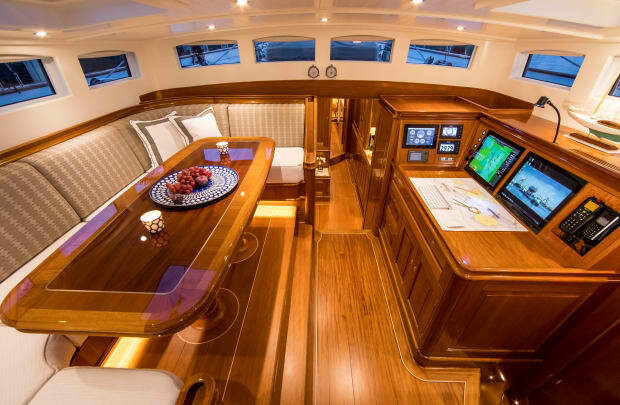 A lovely folding cockpit table with a built-in refrigerator means that guests can sail with the leaves down and get around the cockpit very comfortably. There are removable fiddles and custom Claasen drink holders to ensure that drinks don’t get spilled. Anchor up for lunch, take the fiddles away, put up the table leaves and you have a superb dining area for eight people. Because the owner likes to be involved in sailing and helming, the wheel has been placed in the aft cockpit. The stainless steel work on the steering position and monitoring post is exquisite in this cockpit, which contains a smaller version of the folding table and comfortable seating. There can be few better ways for the owner to start the day than walking through his personal access companionway from the master suite, ascending through the entrance into his private cockpit for breakfast. He might also then invite a friend to join him in catching lunch using the rod holders built into the aft of the boat. This, one might say, is the life. The sense of quality seamlessly continues when you step into Acadia’s interior spaces, where no expense was spared on the mod cons that make for a luxurious stay. For instance, every cabin has its own concealed air conditioning unit – just one of the ways in which the available space has been ingeniously used. The interior ambience is one of timeless elegance thanks to Hoek Design’s template of raised and fielded mahogany panels and white-painted panels above the wainscot level. A great deal of care has also been invested in the layout by everyone involved in the project. For instance, the way that the desk area and overhead has been treated in the master suite maximises headroom and enhances the light and roomy feel. This cosy suite with its beautiful finishing, smooth, curved surfaces and optimal provision of space again reflects the owner’s influence on the project. It also features a painting by Susan Downing-White, a modern piece specially chosen for the way its maritime theme reflects the art which the owners have at home (the same is true of the artwork by George Dunbar in the lounge). There are seating areas either side of the large central bed. As is the case in all cabins, electric lifts under the mattress make for easy access to the storage spaces beneath. Other highlights of the master include electrically operated recessed Roman blinds, dimmable LED lights and a hidden television. 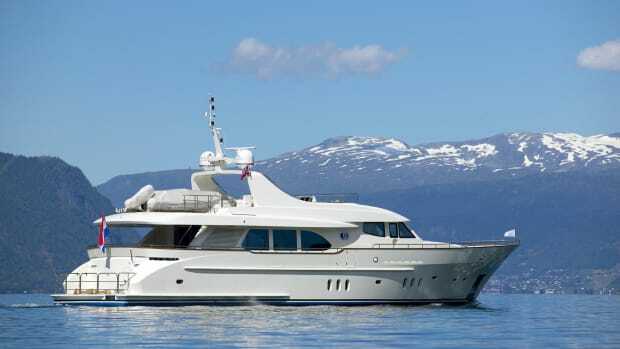 The owner’s cabin has direct access to the amidships section of the yacht, which is home to the deckhouse dining and navigation area. The connection from the deckhouse introduces a lot of natural sunlight into the lounge three steps below while fully retaining the connection with the outside environment. Further forward is the galley, which includes high-end equipment such as a custom freezer box, a gimbaling induction hob and stove, and lots of built-in cupboards with a multitude of custom fixtures for the cutlery, crockery, chargers and platters. 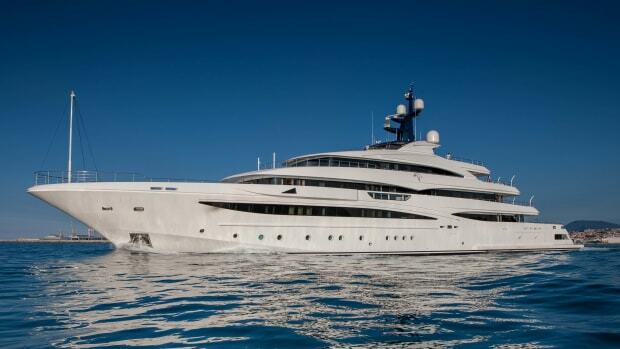 There are two guest cabins: a VIP on the port side with double bed and a twin-bunk cabin to starboard. 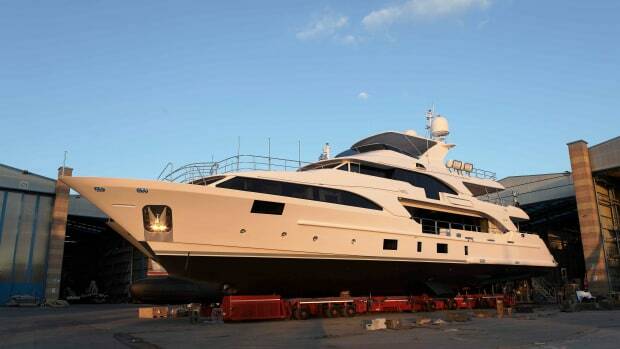 The double crew cabin is in the forepeak and there is an additional ‘pocket cabin’ aft, on the starboard side after leaving the owner’s suite. This will be used as an extra stewardess berth when Acadia is being chartered and the day head also contains a shower (and washer dryer) for crew use during these periods. Acadia’s engine room has been optimised to make the most logical use of space with all the systems installed in the best possible place for maintenance and access. Areas such as the generators and air conditioning, which rarely need to be accessed, are positioned in the back. As Claasen CEO Joachim Kieft concludes, the engine room is another example of how his yard continuously learns from experience as to what works best.